Year after year in my new home here in Northern California, I feel myself sinking down roots and developing new traditions. One of them is curing my own olives, which begins for me in early October. On some crisp autumn Saturday, I will head out into one of the many public parks near my home that someone wisely planted with olive trees a generation ago. Sometimes I go solo, sometimes with friends. When I return, college football is in full swing, and I watch the games as I sort through my haul and prepare the brine. And after that first season, I’ve eaten a handful or two of last year’s olives as a snack while the work is progressing. It’s a quiet little tradition, but it’s grown on me: Cool sunny October days mean gathering green olives and watching a Big 10 football game (I am a Wisconsin graduate). On one such Saturday, I went out with Elise from Simply Recipes to a public grove I knew would be loaded: Olives are alternate-bearing crops, with one year’s crop thin, the other flush. It should have been a flush year for a Mission olive tree in the park, but it was either picked clean or failed to set. No matter, there were 30 other olive trees to choose from. Most were rotten with olive fly, whose larvae burrow into olives and leave a beige scar where they entered. Tiny dots on an olive are OK, but that telltale scar means there is a visitor lurking within your olive. Another hazard are the dry olives. Trees forced to live by their own wits — away from regularly watered grass — are stressed, and their olives shrivel early. 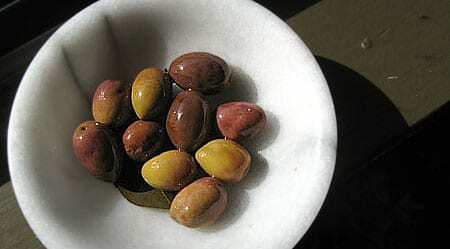 Shriveled olives are usable, but they bruise rapidly and don’t make a clean green olive. Elise and I still found several pounds of good green olives that day. Back at home, we set to separating them. My Badgers were getting their asses handed to them by Ohio State, so I kept my focus on the olives. I decided on doing the water cure with the large olives. The water cure is a Greek method in which you open up the olive somehow and then soak it in cool water for up to a month, changing the water every day, or even twice a day. I’ve tried smashing the olives with a mallet, which is what many recipes suggest, but don’t like it. Too messy, and I don’t like broken olives. So I slice them all with a paring knife. 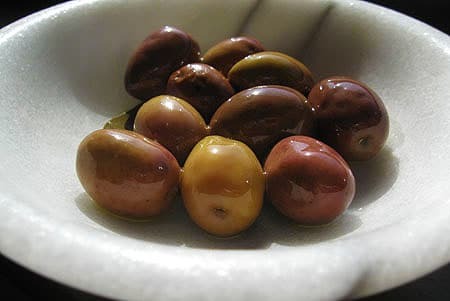 Make sure to drop the sliced olives into water immediately or the sliced area will oxidize and turn brown. The whole olive will turn “olive drab” in time, but you don’t want the color to be uneven. Why change the water so often? Well, if you’ve ever bitten into a fresh olive, you know it makes eating a raw acorn or an unripe persimmon seem fun by comparison. 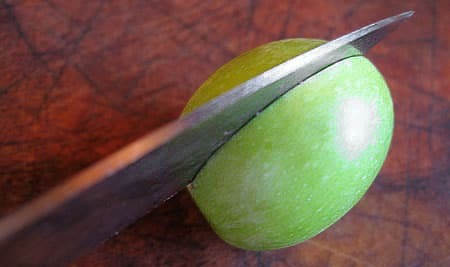 Olives are loaded with a bitter principle called oleuropein that needs to be leached out. Opening the olive allows that stuff to dissolve into the water. That’s why you need to change the water once or twice a day to maximize the leaching process. Also, make sure you do this in the fridge: It seems to keep the olives firmer than if you do it all at room temperature. I’ve done both ways, but the fridge method gives me better results. 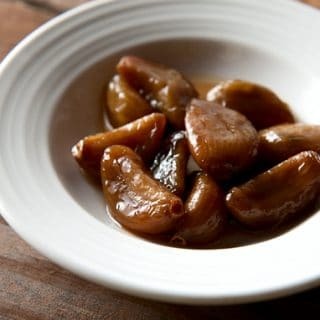 Most recipes for water-curing olives say to change the water for 10 days. I’ve done this before and they are still mega-bitter. So I am recommending three weeks to a full month. While you are curing the olives, you need to keep them submerged to avoid oxidation. I use a small bowl on top of the olives as a weight. You could also use cheesecloth. After your water-cured olives have gone through a month, move them to a brine. I use 1/4 cup kosher salt to 4 cups cool water. I also add 1/2 cup of white wine vinegar, plus any herbs I want to use for flavoring. What herbs? Always bay leaves and coriander seeds. Beyond that I improvise: Citrus rind, black pepper, chiles, oregano, rosemary, sage, garlic, Sichuan peppercorns, etc. Go easy though: Water-cured olives should taste like olives — slightly bitter, firm and rich. My advice is to choose just a few seasonings and leave it at that. These olives will last a year in the fridge. So much for the water method. The olives you see at the top of this post are cured in brine. This is my preferred method, as it is low-maintenance and results in a super-tangy, salty olive that keeps for more than a year and cries out for beer or ouzo. And I like ouzo. A lot. Brine-curing is stupid easy, but takes a long time. Use the same brine as in the end of the water-cure: 1/4 cup kosher salt to 4 cups water, plus 1/2 cup of white wine, cider or simple white vinegar. Submerge the olives in this brine and top with cheesecloth or something else to keep them underwater. Do not cut them. Cover the top of the container loosely (I use those massive jars from the Costco marinated artichoke hearts) and put the jar in a dark, cool place. That’s it. Check it from time to time — meaning every week or so at first. The brine should darken, and you might get a scum on the top. That’s OK.
What’s going on is that your olives are fermenting; it is the fermentation that breaks down the oleuropein over time. That’s why I never wash my olives before curing — I want those natural yeasts on the outside of the olive to do their magic. I change my brine every month or two, when it begins to look extra nasty. I don’t re-rinse the olives, during changes, either, because I want the residue to act as a “starter” to get the next batch of brine going. Keep in mind you will be in for the long haul: Olives picked in October are typically ready to eat in May or June. It’s a lot like making wine. Add seasonings after the New Year, otherwise you risk too much spice and not enough olive flavor; this is especially true of chiles. If you find you’ve gone too far, change the brine and don’t add new seasonings, and let it steep for a few weeks. That should calm things down a bit. For those of you living in olive country, there’s no reason not to forage for your own olives. In most places, they are free for the taking. And once the olives are finished, there is a certain show-off factor when you pull out a plate of olives you cured yourself. “These are your olives? Wow.” Plus, you can flavor them any way you like, which is a bonus. For the vast majority of you who don’t live in olive country, you can order fresh olives online, but I can’t personally recommend any companies because I have never used them. 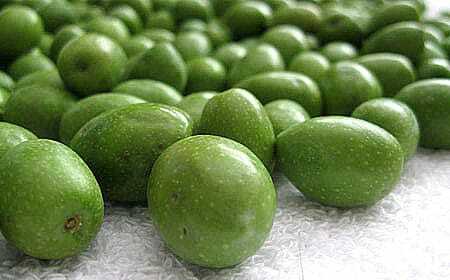 If any of you have ordered fresh olives online and can vouch for a company, please let me know. Incidentally, this method only works for green olives. If you want to cure black olives, my method is to oil cure olives. Discover more ways to cure olives, as well as other recipes for preserving the harvest here! After the brine green olives are finely ready, what is good water:salt ratio for storing them? 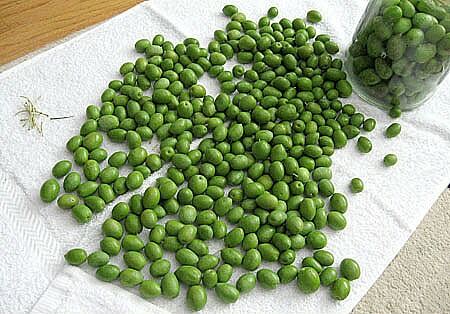 The same as for curing them, 1/4c salt to 4c water? Lucinda: Typically I use 1/4 cup of kosher salt (Diamond Crystal brand) to 1 quart of water.